Do we have a good one for you today – the venerable Nexus 6 goes up against the new Samsung Galaxy S6 Active…much like the beauty and the beast. The Nexus 6 is the largest Nexus device ever produced and made by Motorola it resembles a large Moto X, which is a good thing. The Galaxy S6 Active is designed with most of the original Galaxy S6 features, except that it has a protective, camouflage plastic-type case – gone is the beautiful glass and metal body. It is designed for the user that loves the great outdoors…someone that might drop it in the stream or down a hill. Both devices have great specifications, although the newer Galaxy S6 Active definitely has the advantage. Both devices use the AMOLED technology and use the QHD display resolution – the S6 Active with more pixels-per-inch, due to its smaller display. The devices both use 3GB of RAM and 32GB of internal memory and neither device has external expansion available. The main cameras are close in size – 13MP on the Nexus 6 and 16MP on the S6 Active – however, the specs and results favor the S6 Active. Both devices have large – 3220mAh on the Nexus 6 and 3500mAh on the S6 Active – non-removable batteries. Both also have some sort of water resistance as the Nexus 6 has a nano-coating and the S6 Active has the full IP68 dust and water resistance. They both have the usual suspects – Wi-Fi, Bluetooth 4.1, GPS, NFC and microUSB port for charging and data transfer. Both devices enjoy wireless charging, although the S6 Active has both Qi and PMA standards and the Nexus uses the Qi technology. Google took the Nexus 6 in a new direction from past Nexus smartphones and many loyal Nexus owners were somewhat put-off by its size and price. 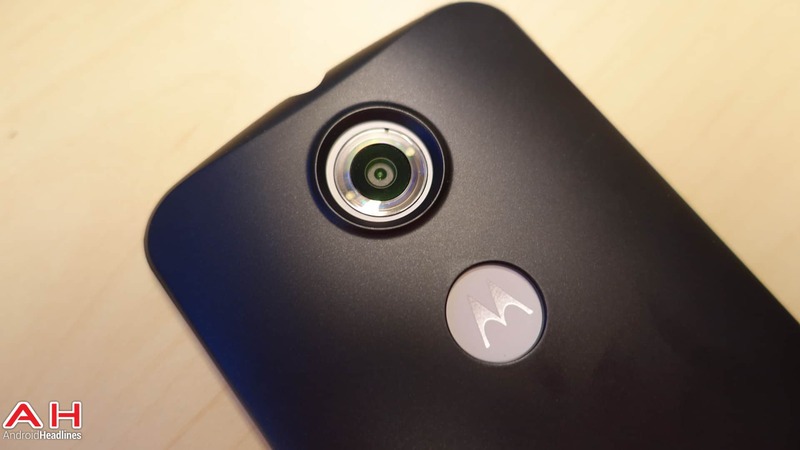 When they nabbed Motorola to build the Nexus 6, it was bound to have some of its roots from another favorite device – the Moto X. 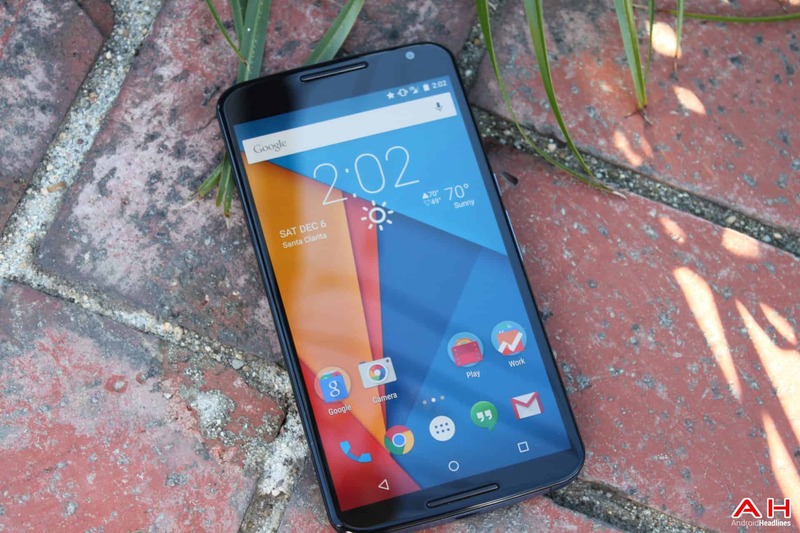 Think of the Nexus 6 as a Moto X on steroids – bigger and better in every way. It still maintains the Moto X’s shapely curved back…but straight display, making it easier to hold even with its large size. Starting with its huge 6-inch – a tad large for most people – Quad HD (QHD) AMOLED display with a resolution of 2560 x 1440 pixels and 493 pixels-per-inch (PPI), it squares up quite nicely with the 5.1-inch QHD display on the Galaxy S6 Active with 576 PPI. Motorola used the best processor available at the time of its design – the Qualcomm Snapdragon 805, a 32-bit quad-core processor clocked at 2.7GHz. The S6 Active uses a newer 64-bit octa-core processor. Both the Nexus 6 and the S6 Active have the same 3GB of RAM and 32GB of internal storage as standard and neither one has the ability to expand their internal memory, although you can get a 64GB Nexus 6 model. The Nexus line is not known for their photographic prowess, however the camera on the Nexus 6 was another surprising upgrade. The main cameras are not too far apart and both will take great pictures and video, although the nod will still have to go to the S6 Active. The Nexus 6 uses a unique dual-tone flash ring around a 13MP lens and comes with autofocus and OIS…it does not have the 16MP lens, f/1.9 or Live HDR capabilities of the S6 Active. The small 2MP front-facing camera (FFC) does not hold a candle to the huge 5MP FFC in the S6 Active…also with an f/1.9 aperture and wide-angle lens. The Nexus uses a huge non-removable 3220mAh battery to make sure you will get through the entire day without having to charge…and when you do need a charge, you will be able to use Motorola’s Turbo Charger that comes with the Nexus 6 and get up to a 60-percent charge in only 15 minutes. The S6 Active also enjoys a larger non-removable 3500mAh battery and coupled to its new display and Exynos 7420, it is designed to get you through the entire day and then some. As far as extras go, the Nexus 6 enjoys dual front-facing stereo speakers, a full metal frame and water resistant nano-coating, built-in wireless charging and shares the latest Android 5.0 Lollipop, completely unskinned with the fastest upgrades available. It is available on all major US Carriers for $199 (down from $249) on a two-year contract or the newly reduced cost of $499 (32G) and $549 (64GB) off-contract in the Google Play Store, with your color choices of Midnight Blue or Cloud White. The Galaxy S6 Active shares part of its name with the sleek, new Galaxy S6 – however, stripped away is the pretty glass and metal body and replaced by shock-resistant plastic that looks like you put on a case to engulf your Galaxy S6. It will protect your device from drops and most outside damage – and comes in three colors, camo blue, camo white and camo gray with the gray version the most palatable. Most of the technology of the S6 is ported over to the S6 Active, but there are a few changes – gone is the fingerprint sensor and capacitive buttons, which are replaced by three physical buttons. There are some added benefits as well, such as IP68 certification for dust and water resistance up to 1.5 meters and up to 30 minutes under water, but also adds a MIL-STD-910G certification, which means it is resistant to salt, dust, humidity, rain, vibration, solar radiation, transport and is thermal shock resistant. The new three mechanical touch buttons provide a nice click and feedback to the user. The device also has an extra programmable button on the left side just above the volume rocker that defaults to the Samsung Activity app, but you could reset it to be a camera button or to perform one of many other duties. The Activity app is a collection of apps that would interest a camper or hiker and it immediately brings up a menu with a flashlight button, the weather, compass and other features an outdoors person might need to use. 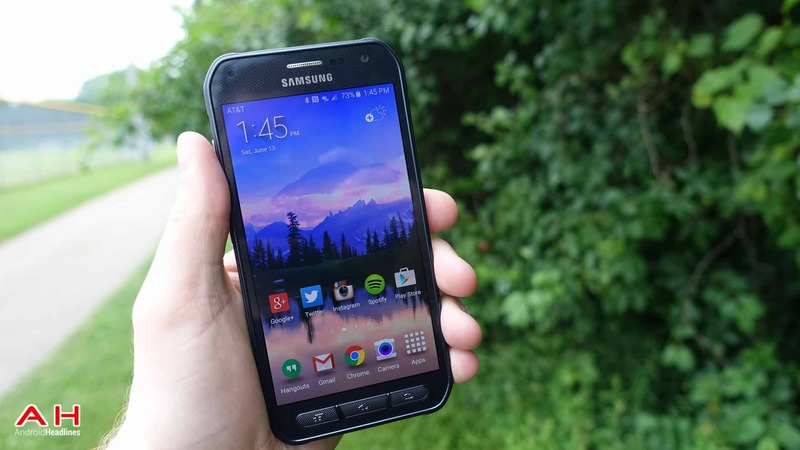 The Galaxy S6 Active has the same display of the normal Galaxy S6, a 5.1-inch QHD Super AMOLED display with a resolution of 2560 x 1440 pixels and about 576 PPI – this compares to the 5.96-inch AMOLED display with 493 PPI on the Nexus 6. The S6 Active uses the same processor in the Galaxy S6 – a 64-bit Exynos 7420 processor…the first one to use 14nm technology. It is an octa-core processor with four cores clocked at 1.5GHz and four cores clocked at 2.1GHz. This is more advanced technology than found in the Nexus 6’s Snapdragon 805 quad-core processor. The both have 3GB of RAM, but the S6 Active uses the faster DDR4 RAM and they both have 32GB of internal memory, although the S6 Active uses a new and faster UFS 2.0 flash memory. The Galaxy S6 Active comes with only one 32GB internal memory option – gone are the 64GB and 128GB options offered in the normal S6. The Nexus 6 comes with 32GB of memory, but has a 64GB option as well…neither device has any room for expansion. The Galaxy S6 Active comes with a 16MP main camera with autofocus, LED flash, real-time HDR, f/1.9 aperture and OIS…it has one of the best cameras found on a current smartphone. It also has a 5MP FFC wide angle with the f/1.9 aperture and Live HDR for great group selfies and video chats. This compares to a 13MP main camera and a small 2MP FFC on the Nexus 6. The Galaxy S6 Active carries a huge 3500mAh battery, replacing the smaller 2550mAh battery found in the Galaxy S6, and should last into a second day of heavy usage. The Nexus 6 has a smaller 3220mAh battery, but it will get you easily through a day. Both devices have non-removable batteries, offer a fast charge option and both have built-in wireless charging. Other things that the Galaxy S6 Active has the Nexus 6 does not, would be the heart rate sensor, the oxygen saturation sensor, built-in wireless charging for both Qi and PMA standards – the Nexus 6 includes only Qi wireless charging. The price is the same as the regular Galaxy S6, so if you want this rugged device, it will cost you about $200 on a two-year contract or about $700 off-contract. This is a real tough one – the Galaxy S6 Active is the winner in specifications, however, it may be more ‘rugged’ a device than most smartphone users need. It has Samsung’s Super AMOLED display technology, giving it an edge in the display area. It also has a more advanced 64-bit Octa-core processor with 14nm technology, faster DDR4 RAM and UFS 2.0 flash memory. It also has better cameras, full water and dust proofing and military specs for harsh conditions. The Nexus 6 is more ‘refined’ looking and runs pure Android, which means it also receives the fastest upgrades when a new version of the software comes out. It is a good, solid device, with a huge QHD display and plenty of processing power to make most anybody happy. Pricing is better than the S6 Active – $500 versus $700 off-contract. Although a little large for some users, it makes a beautiful everyday driver that feels more at home in an office than the Galaxy S6 Active. The choice is yours – if you want the best specifications or use your device in the rugged outdoors, then the Galaxy S6 Active is the one for you. However, if you are not an outdoor enthusiast, and feel more comfortable wearing casual clothing or a suit, then the Nexus 6 would be your choice. I am betting that more users would prefer beauty over the beast, so I am declaring the Nexus 6 as the winner of this comparison. 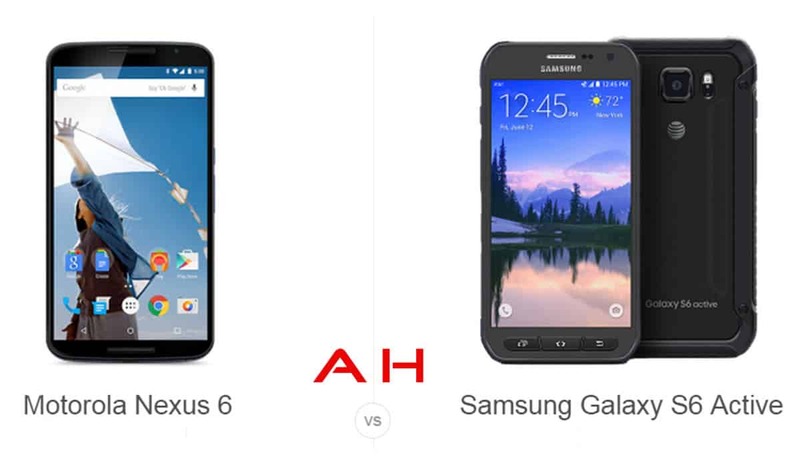 The post Phone Comparisons: Motorola Nexus 6 vs Samsung Galaxy S6 Active appeared first on AndroidHeadlines.com |.